March 8 is your holiday—a precious day! I wish you all the very best that anyone can have in this life: children, grandchildren, love and warmth! As well as slight understanding of what this life prepares us for. Let the whole world be a delight for you! Wishing to unite with the group, in it we discover a need for the Creator’s help. To the extent we connect to friends, we feel the Creator’s revelation between us. Changes in attitude in the group enable us to reveal the Creator more and more, and in different ways. By dissolving in the group, I merge with the Creator. It is written, the nation of Israel went into exile in order to attach the other nations to it and for everyone to aspire to the common correction of the common soul. Evading this mission leads the nation to disasters: destruction of the Temples, exile, extermination. Now we have yet another chance …. We have already learned our lessons from every sort of attempt by governments to improve our lives. We see that it doesn’t get better. It can get better only if the people unite. The whole system of the common soul, Adam HaRishon, the creation created by the Creator, already exists. Only in relation to us does it look as if it is broken and suffering without Light, harmony, and direction. Shattering works only in relation to us so that we would feel what we have lost and what we lack to reach the perfect state. In this way, we begin to understand, feel, and study the system of creation, and manage to rule it. It is like we bought a Lego set for a child, opened the box, saw a pile of different pieces in it, and we say: “Let’s build a house.” The child begins to think about how to connect the pieces together. Similarly, the Creator made a puzzle or “Lego of creation” for us. We exist in a perfect system in which there has never been any deficiency, and concealment has been made only in relation to us. We must compensate for this concealment by building ourselves. This is an interesting game, as if on a computer. To the extent of our understanding of what the system should be, we can see how another part of the system, correctly connected with the rest, reveals itself on this computer. It seems to us that we are building this system, but in reality, we only reveal that it already exists. All we need is to join the place that the Creator has led us to, the ten, to include ourselves in it, so we will understand our place in the common system. Three days of the congress are in store for us during which we will be able to make a big leap in the path. We have prepared a lot and achieved significant success in connection, which we can now further develop. Anyone who “went through the desert,” that is, participated in the desert congress in Israel and was with us around the world, can now make a massive leap forward, precisely due to their connection at the congress with the outside Israeli public through their AHP de Rosh. The meaning of life can be understood only from the science of Kabbalah. We have to go through a lot of blows and disappointments until we realize that our life will definitely end and that we have no chance to succeed in it. Everyone will die, like any animal will decompose in the ground and nothing will remain of it like all those who lived before us. The only way to stay alive is to bring your inner part to the spiritual world, to develop your point in the heart at least in the minimal form: include it in the group, to several more people like me. Then I will have the right to exist. No particle of creation can exist unless it joins other particles and exchanges energy with them. This is the whole difference between decomposed dust and living matter: they are distinguished only by the presence of an internal connection between the parts. Therefore, we must connect with each other in such a way that spiritual life appears between us, and for this purpose we need work in the ten, in connection, and at congresses. A Blessing For The Family? 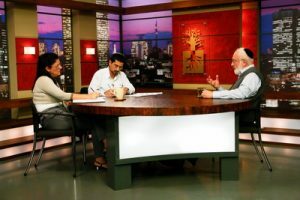 Question: Can I ask the Creator for a blessing for my family and friends who are not interested in Kabbalah? Answer: You can ask, but I do not know what will come of it. I do not think that something special will result because the request should be a request for correction and you ask for the improvement of a situation, but improvement is impossible without correction. Question: Can I ask the Creator to send me the Light to correct my egoism? Answer: Yes, it is possible, but your request should be as selfless as possible. Why do we lie, is lying ever necessary, and how can we deal with the phenomenon and develop correct relationships? Where there is love, there is no need to lie. When the human heart is corrected and we desire to connect with one another, lies and manipulation will be replaced by truth. Lies cause distortion in the communication that is happening within a network, within a system. The goal of the network is to bring all of us to be as one.